An art gallery's future has been "cast into doubt" by plans to slash its funding. 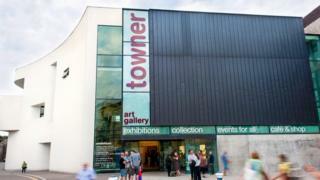 Almost half of Towner Art Gallery's exhibitions will be lost under Eastbourne Borough Council proposals to reduce its £614,000 annual investment to £400,000. Board of trustees chair David Dimbleby said it was "putting at risk everything that Towner stands for". The council said it is the first time it has reduced financial support. A spokesman added there have been "the most severe year on year cuts in government funding to the council". He said they had to prioritise protecting frontline public services and avoiding council tax increases, but the gallery would still receive "significant indirect council support". The money goes on exhibitions, a learning programme, and maintaining the building. Further cuts are also forecast for subsequent years. According to broadcaster Mr Dimbleby, Towner's Learning and Outreach Programme is at risk. Last year it worked with 70 schools and 8,000 children from Eastbourne and across East Sussex, providing young people with free organised creative activities in the gallery. It also provides support and creative development for thousands of vulnerable people, including adults and children with mental health conditions and people living with dementia and memory loss. A spokesman for the gallery said the loss of the programme would have a "profound impact" on the community. Nearly 150,000 people visit the gallery per year, which is the largest in the south east outside of London, and its history dates back almost 100 years.